If you like your sermon short and to the point, go Anglican. If you like your homilies at industrial strength, learn French! That's the message learned by almost 70 Mystery Worshippers as they timed sermons across London on 24th April. The tub-thumping mega message is still being preached each week in the capital  but you'll probably need to seek out one of the smaller denominations for the experience. In fact, the longest sermon in London took a rump-wearying one hour and 20 minutes  and was delivered in French at Pierres Vivantes in Hyde Park. At Westminster Chapel, Buckingham Gate, one Mystery Worshipper reports how a dog sat through a sermon 52 minutes long. "The preacher said some good stuff," admits Hurdy Gurdy (all Mystery Worshippers adopt a pseudonym), "but I kept checking my watch and began praying for the end. At least it got me praying." 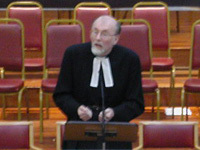 The Church of England delivered the most compact sermons  six of the Top 10 shortest sermons were delivered during Anglican services. The average sermon length across all the churches visited was 20 minutes 31 seconds.